Israel police arrests: Palestinian teenagers' deaths investigated. A scene from protests in May. A breakthrough occurred after the Palestinians provided a bullet found in Nuwara’s backpack. The bullet prompted investigators to inspect the weapon of one of the policemen, leading to his arrest on suspicion that he had fired live bullets and had lied about his role in the shooting. … video taken from a security camera at a business in Beitunia, a town outside Ramallah, showed that the two youths were knocked down, apparently by gunfire, about an hour apart. 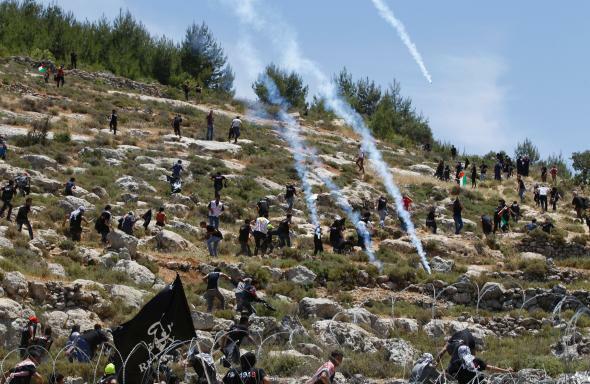 The teenagers were at the site of intermittent clashes between security forces and Palestinians observing Nakba Day, when Palestinians mark Israel’s creation and mourn the expulsion and flight of hundreds of thousands in 1948. The teenagers did not appear to be engaged in violent or provocative behavior at the time they were shot. Palestinian-Israeli relations have been even more tense than usual in recent days; two Israelis were stabbed to death Monday in terror attacks, while a West Bank mosque caught fire overnight last night in what was possibly arson perpetrated by Israeli settlers.